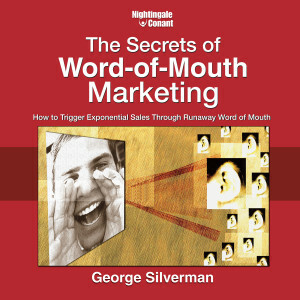 George Silverman is President and Founder of Market Navigation Inc., a marketing consulting firm in Nanuet, New York. He's an acknowledged expert on word-of-mouth marketing, conducts speeches and workshops all over the world, is a member of the Advisory Board of WOMMA (the Word-of-Mouth Marketing Association), and is a frequent speaker at WOMMA's conferences. He's also a former psychologist, the inventor of the telephone focus group, and co-inventor of the peer word-of-mouth group ' widely acknowledged to be the most powerful marketing method ever developed in the pharmaceutical, agricultural, and medical device industries. He has also created successful WOM campaigns for many major companies, including dozens of Fortune 500 companies.